Double beef burger topped with double cheese, double bacon, 2 x jalapeño poppers and a layer of pulled pork! I've spent the last week or so preparing Christmas art projects and advent calenders so it's nice to unwind with a burger. 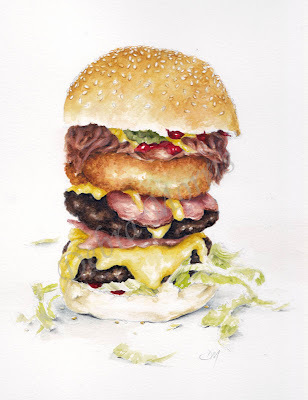 Thinking of getting myself an extreme veggie burger at the end of this project. As these are done from photos it would be great to do one from life and could last me all day. How many calories in this one???? This is brilliant, I can't imagine anyone eating one though! This should be on a billboard! Crazy! I just love your artwork! The way you draw the subjects and bring out the uniqueness of each part, and the ideas that you come up with! I'd love to have a whole book of your art! I thought I commented on the other burger but don't see it. This must be extreme painting - it must be terribly fun to do! And it's fun to look at. Each burger has its own personality. You are the food artist of food artists! I too love your artwork!!! Your food illustrations look like something one could reach out and grab and eat!!! Whoa! How are you supposed to eat this burger? I agree with Sofia - it should be on a billboard. I am totally drooling just by looking at this :) Your work is amazing!